Take your yoga practice to a whole new dimension! Chocolate Yoga is about diving deep inside and unleashing your own raw energy, so you can experience the bliss of who you really are… pure love… pure consciousness.We believe that yoga, meaning union, is ultimately a spiritual journey. It is a journey that takes us through the physical body and beyond into the realms of pure consciousness. It is the union of the body-mind with the soul. We are here in service to make that journey as yummy and delicious, and as powerful and blissful as we possibly can, for you. Cacao (chocolate in its purest form), is a forgotten plant medicine – an ancient teacher and facilitator that assists you with the journey into your heart. 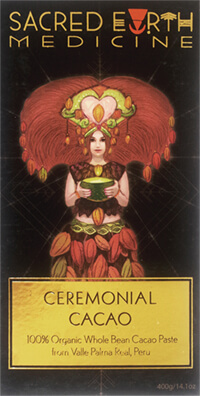 Cacao was known to the Ancient Mayans as a powerful heart opener and potent healer. Perfect for deepening your yoga and meditation practice! Chocolate is widely known as an aphrodisiac and this understanding of how it opens our hearts is by no means new. The Aztecs often spoke of Cacao as ‘yollotl, eztli’, meaning “heart, blood”. Western science reinforced this by giving it the scientific name Theobroma Cacao, which means “The food of the Gods” – and what else would the food of the Gods be but love? No wonder we give chocolate on St Valentines Day. 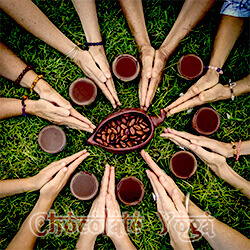 Chocolate Yoga uses the highest quality cacao available on the market – what we call Ceremonial Grade Cacao. We ensure this by using a wild/native variety that is traditionally grown and hand-prepared by indigenous Mayan people in the Lago de Atitlan region of Guatemala. This is the same variety and preparation method that the ancient Mayans used to ensure full potency. Our Cacao is grown and processed without any chemicals and the Mayan workers, primarily women, receive fair pay for their work. We sustain this superior quality by maintaining a direct relationship to our source, and by keeping this a small-scale operation which makes each batch of Cacao unique.